The 469-mile Blue Ridge Parkway was built during the Great Depression — and even then was a big, complicated and messy task, albeit one intended to create jobs and promote tourism. None of the experts interviewed by NPR seemed to believe it was possible anymore to build such a big project and some believe the money would be better spent fixing existing infrastructure before creating new projects. 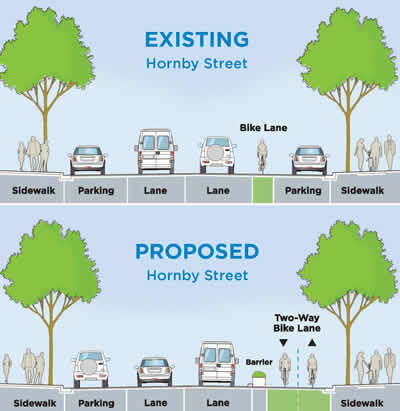 The city of Vancouver's plan for providing for more space for cycling on Hornby street in downtown. Credit: city of Vancouver. The City Council in Vancouver, B.C., approved a six-month trial for a protected bike lane through downtown — that is a bike lane in which there is a physical barrier separating cyclists from vehicles. “Once this new lane is in place, there will be a continuous, connected network of paths running through the heart of the city—something 75 percent of residents said they wanted in a recent poll,” notes the blog. Cycling is the fastest growing method of travel in Vancouver. Approximately 60,000 trips are made on a bike every day in the City of Vancouver. More than 3,500 cyclists commute to work downtown every morning, which is the equivalent to 65-75 full transit buses. About four percent of commuting trips in Vancouver are made by bike, in some neighbourhoods, over 10 percent of commuting trips are made by bike (2006 Statistics Canada Census). In some neighbourhoods such as Kitsilano and Grandview-Woodlands, more than 10 percent of work trips are made by bicycle (2006 Statistics Canada Census). 15.9 percent of residents in Vancouver cycle or walk to work (2006 Statistics Canada Census). 41.4 percent in the Downtown and West End cycle or walk to work (2006 Statistics Canada Census). Almost half of all Vancouver residents commute less than five km to work and more than 80 percent commute less than 10 km – these relatively short distances are ideal for cycling. 60,000 City of Vancouver bike maps were printed and distributed in 2009. The City has more than 300 traffic signals with cyclist push buttons. The ORCA card is the Seattle area’s version of the TAP card. And, in fact, you can read this post and substitute TAP for ORCA because many of the issues raised by users up there are the same ones as down here. The big one is: Where can I buy one in person? The answer is a few transit centers and soon some ticket vending machines, as well as Safeway stores. Sound Transit pushes customers to buy and reload the cards online — but sometimes that means a delay in products actually being loaded onto cards. Actually, the ORCA card is very, very, very easy to get in comparison to the TAP card. First, you can get one by mail from the multilingual (TAP’s is still English-only?!?) website without having to buy a pass-ORCA’s have had cash purses from day one. Second you can get one at ANY Sound Transit TVM, the issue here being that since there is no rail transit on the Eastside of Lake Washington, there are no TVM’s there either, but this is about to change with a TVM about to be installed in a bus-only Transit Center in downtown Bellevue. I know of no LA Metro TVM that sells the TAP card, even though the same Cubic models in San Diego can dispense their Compass Cards. Third, you can go and talk in person to a real live Human in downtown Seattle. Can I do that with TAP? No, I get directed to a telephone to call from when I go in person to One Gateway Plaza. In greater Seattle you can also get ORCA cards from the Customer Service offices of the other transit agencies the are part of ORCA, including the ones in Everett and Tacoma, WA. Did LA Metro bother to get all agencies in L.A. County together on a common fare policy/transfer system before implementing an RFID card? No. I encourage you all to take a trip to Seattle, learn about PugetPass, Orca’s fare-coordinating predecessor and now that Cubic has bought out ERG’s USA operations, (ERG set up ORCA) get those ex-ERG individuals down to L.A. and get them to fix TAP. Because it needs help.